Linda started her nursing career in general practice, qualifying in 2002. She then spent many years working in specialist clinics at two university referral hospitals. She has obtained the Diploma in Advanced Nursing (Medical) and a Veterinary Technician Specialty (Oncology). She is a qualified animal trainer, behaviour practitioner. In autumn 2018, Linda also became a Veterinary Technician Specialist in Behaviour. Linda runs Inspiring Pet Teaching, aimed at pet and owner training and education, and continuing education provision for veterinary and para-professionals. 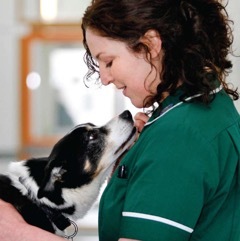 With a foot in both the camps of veterinary nursing and behaviour, she has a strong focus on the interplay between clinical practice and animal behaviour, and on the value of an interdisciplinary team to provide the best possible care and education to pets and people. She is passionate about cooperative care and patient-friendly practice, and regularly teaches on this topic to veterinary professionals.